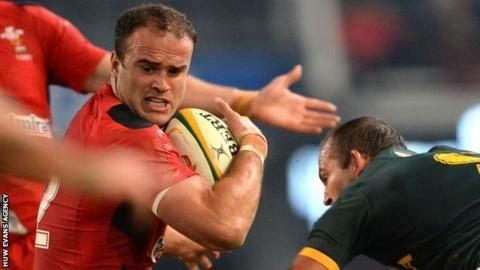 Centre Jamie Roberts has promised there will be no repeat of the sin-binning offence that helped South Africa beat Wales in the first Test when the sides meet again on Saturday in Nelspruit. Wales conceded 14 first-half points in their 38-16 defeat in Durban after Roberts tackled Willie le Roux while the Springboks full-back was airborne. "You learn from it… it won't happen again," said Roberts. Wales have never beaten the Springboks in South Africa. However, Roberts was man of the series for the British and Irish Lions in the 2009 series in South Africa. The Lions lost the series 2-1 but the 6ft 4in Wales inside centre formed a potent midfield partnership with Brian O'Driscoll. Jonathan Davies took over from O'Driscoll alongside Roberts for the final Test of the Lions' 2-1 series win over Australia in 2013. And Roberts expects his partnership with Davies to show a big improvement on their efforts in Durban when makeshift Boks duo Jan Serfontein and JP Pietersen outshone the Welshmen. Racing Metro star Roberts hopes he and Davies can enjoy an improved attacking platform courtesy of Wales' forwards, saying "everything must come together". He added: "Myself and Jon have to demand the ball a bit more this week and maybe play a bit more direct and get in the game a bit more. "And I think defensively we need to go up a notch as well - we made a few mistakes between us last weekend. "We trust each other, we know our game inside out and we have to make that pay Saturday." Roberts says he did not sleep well last Saturday night as he reflected on his sin-binning. He added: "We weren't good enough to win the game and we conceded some soft tries - that's what hurts the most. "Obviously [they scored] 14 points whilst I was in the bin and that hurts the team and it hurts personally as well. "I didn't sleep too well on Saturday night - [but] Sunday you have to forget it. "And yes it happens in players' careers, but you have to make sure it happens only once. "It was a definite yellow, there's no doubt about that, and as soon as it happened and I saw it on the big screen you've got no qualms - I got what I deserved." Wales: Liam Williams (Scarlets), Alex Cuthbert (Cardiff Blues), Jonathan Davies (Scarlets), Jamie Roberts (Racing Metro), George North (Northampton Saints), Dan Biggar (Ospreys), Mike Phillips (Racing Metro), Gethin Jenkins (Cardiff Blues), Ken Owens (Scarlets), Samson Lee (Scarlets), Luke Charteris (Perpignan), Alun Wyn Jones (Capt) (Ospreys), Dan Lydiate (Racing Metro), Josh Turnbull (Scarlets), Taulupe Faletau (Newport Gwent Dragons). Replacements: Matthew Rees (Cardiff Blues), Paul James (Bath), Aaron Jarvis (Ospreys), Jake Ball (Scarlets), Dan Baker (Ospreys), Gareth Davies (Scarlets), James Hook (Perpignan), Matthew Morgan (Ospreys).